When we look at the drumset we are looking at a thoroughly modern invention. It was only since the turn of the 20th century that this instrument even EXISTED! We’ve gone from ‘low boy’ hi-hats and tacked head toms to remote cable hi-hats, every depth and diameter of tom, bass drum, and snare drum imaginable; not to mention enough cymbal varieties that we could sheath the great pyramid and still have bronze left over. It’s easier than than you might think? In this post I hope to be able to offer some ideas (some my own, some I’ve knicked from fellow drummers, articles, etc…) These are just some of the ideas available for you to create your own unique sounds on your kit. The Promark ‘Sizzler’ (or larger ‘Rattler’) are simple ball chains that are attached to a plastic disc that slides onto your cymbal stand. I have these in my stick bag and use them often. However, I also have some homemade versions that work just as well. You can save a lot of money if you go to your local hardware store and seek out the bulk rolls of chain. You’ve got a plethora of options here: small and large ball chains, thin chain link, braided chain link, take your pick! Brass? Stainless? Choose your material. Get a bunch of each and experiment. You can even drape these links over your toms and snare drum for additional raspy and rattly chains. The options are limited only by your imagination. Notice what it sounds like with sticks? How about brushes? How about mallets? Here’s another great one. Take a coin (I love using quarters and dimes) and put a small piece of tape on one edge of the coin and then attach the other end of the tape to your cymbal (ride or crash, doesn’t matter). Hit it. Whoa! Listen to that dusty, cool sizzle sound! Pretty cool and the mics LOVE it! For the simple of price of $0.41 (that’s right: a quarter, dime, nickle, and penny), you can have a host of sizzle sounds at your disposal. How about this one: have a splash cymbal you aren’t using? How about a broken cymbal you just can’t bear to part with? Well, you’ve got the makings of a wonderful stack/sizzle combination that will give your rig a new sharp accent that is easily removable. Simply take that cymbal and experiment with placing it on top of or underneath an existing cymbal. Play around with adjust the tension of the wing nut to open or close the space between the cymbals. Hitting this cymbal stack will create anything from a very metallic sizzle to a sharp white noise/gated sound similar to what you hear in Terry Bozzio’s compositions. Putting the THUD in it. Say you want to take the beautiful long tone from your toms and shorten them up? How about squashing the snare drum sound a little bit? 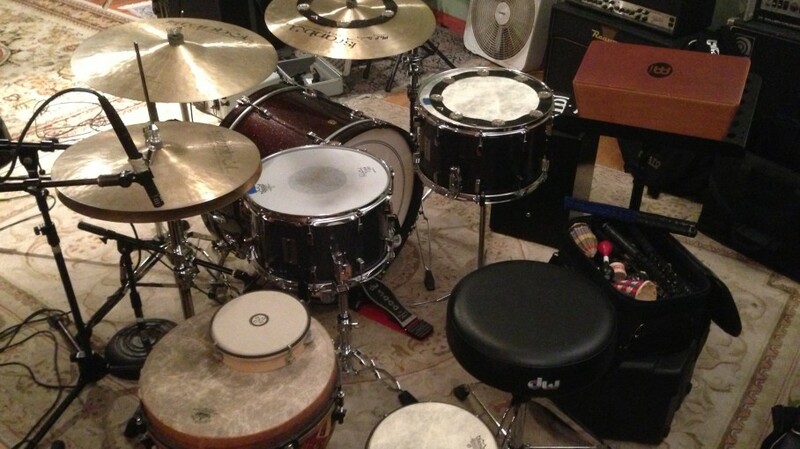 Look no further than the humble tea towel to get your drum set in a completely different sonic space. Old t-shirts also work very nicely. Any of these things tuck nicely into the snare drum case after a gig or session so you always have them available. I recently reviewed a wonderful product called Big Fat Snare Drum (BFSD) that functions in the same way as a tea towel – it just happens to be a 13″ or 14″ piece of mylar that you lay on top of the drum. The benefit of using tea towels, old drum heads, BFSD, etc. is how it fattens up the sound of your kit by significantly reducing overtones and accentuating certain ones that ‘chunk up’ the sound of the kit. I particularly love using mallets on toms and snares treated this way. I have a lot of different striking implements in my stick bag. I call them implements because it is a convenient catch all phrase for the zaniness I keep in my stick bags. I have my usual array of Vater sticks, brushes, and mallets… but I also have chopsticks, knitting needles, sticks with shakers or tambourine attached to them… there’s a lot tucked in that bag and I have it because all of these implements are an opportunity to change your sound and, possibly, your playing. Have you every tried playing a groove with a pair of mallets? You may be playing the same notes but it definitely doesn’t sound or feel the same. Maybe this makes you think of a rhythm differently. When you use something beyond a regular pair of sticks or brushes, you are allowing yourself to explore just what the drum kit can do. Don’t be afraid to reach for something different when you’re playing. Be it wood spoons or small whisks or dulcimer strikers; the results may be just what an artist or producer is looking for and most of these implements can be had cheaply. Try some of these things out and see what happens! We often fall into the same patterns (of playing and what we are playing with). Sometimes these ruts are unavoidable but they can always be worked through. Perhaps some of these simple and cheap hacks might be just the thing to kick start a new year of discovery behind the kit. Dig?